Morrisons is set to launch its Christmas voucher saving scheme on Monday, giving shoppers the chance to save £30 on their big festive shop. For the next eight weeks, customers will get a Christmas Saver coupon for every £40 they spend. If they collect eight consecutive coupons over eight weeks, they will receive a ‘£30 off a £40 or more’ shop coupon to be redeemed between 17 and 31 December. The end saving has increased this year from £25, and this time shoppers who collect six of the eight coupons will be be able to save £25. During the promotions, shoppers spending less than £40 will also receive a variety of vouchers at the till, which can be redeemed on their next visit. These will be processed through the Catalina system, which Morrisons rolled out this summer. I will stick to Aldi vouchers £5 off £35 spend rather then expensive Morrison. 8x40=£320320+40=£360(total spend)360-30(discount)=330Not even 10% d … 8x40=£320320+40=£360(total spend)360-30(discount)=330Not even 10% discount + what you can lose buying more expensive items then at Tesco/Asda/Aldi= They gonna rip you off :(I will stick to Aldi vouchers £5 off £35 spend rather then expensive Morrison. WHat proof do you actually have that Tesco?asda/Aldi will be cheaper? I used to be a long-time Morrisons shopper but recently switched to Asda. TBH they are much of a muchness as regards price, so this deal is excellent for people who would normally shop there. Personally, as we have a fair amount of Morrisons saver stamps, we'll go back there for the next few weeks to get the vouchers and use it over Christmas, like we have always done. I like some offers at Morrison, but £30 is maximum what I can spend during 2 weeks of shopping in there, but 8 times,8 weeks and with £40 spend in a row is just wrong. It's like giving the presents for all Morrison management. If you normally shop at Morrisons this is very handy. Also, if you do your family shop there here's an idea. It's quite easy to spend over £80 a week on a family shop so if you and your partner can go at the same time, take 2 trollies, half in each, both checkout seperately, Bob's your uncle and you've got £60 off your Xmas shop. If you normally shop at Morrisons this is very handy.Also, if you do your … If you normally shop at Morrisons this is very handy.Also, if you do your family shop there here's an idea. It's quite easy to spend over £80 a week on a family shop so if you and your partner can go at the same time, take 2 trollies, half in each, both checkout seperately, Bob's your uncle and you've got £60 off your Xmas shop. noticed that you need even more weeks to get the voucher this year. I think when it first started this you only needed 5 weeks and its gone up every year since. If you work it out its a rough saving of £3.75 a week I think I can save this by shopping round the supermarkets like I already do. Good offer for those who only shop at Morrisons though. More importantly when are they going to have their annual 50% off champagne bonanza? You need 8 separate weeks till receipts so you would actually need to split your shopping over 8 visits. Of course. If I had half a brain I would have thought of that. More importantly when are they going to have their annual 50% off … More importantly when are they going to have their annual 50% off champagne bonanza? Did this last year but it's a pain having to go every single week to get the full discount, so cold from me and we're giving Morrison's a miss this year. DibCochraneOct 26, 2012If you normally shop at Morrisons this is very … DibCochraneOct 26, 2012If you normally shop at Morrisons this is very handy.Also, if you do your family shop there here's an idea. It's quite easy to spend over £80 a week on a family shop so if you and your partner can go at the same time, take 2 trollies, half in each, both checkout seperately, Bob's your uncle and you've got £60 off your Xmas shop.You need 8 separate weeks till receipts so you would actually need to split your shopping over 8 visits. they're saying that you can get two separate £30 vouchers if you split your £80 weekly shop into two £40 ones, check out separately and do this every week for eight weeks, you halfwit. Come on guys £30 off your xmas is shop is a fab offer!!! And those who spend less than £20 on a weeks worth of shopping: Could you please tell me what your secret is? I go to Morrisons every week and spend £60 on average (this is for 2 people with no kids). I like cooking nice and healthy meals thou and do not buy unhealthy frozen fast food and ready meals! I used to go to Asda and for some reason my shopping bill used to be over £75 (I buy the same stuff every week) so all these stupid adverts about Asda or Tesco being a lot cheaper are a load of tosh! Morrisons are actualy a lot cheaper than Asda and Tesco! 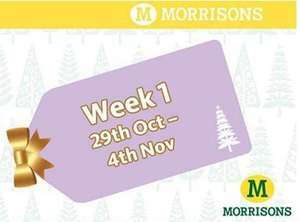 It's only a fab offer if you already shop at Morrisons every week; for me it was a pain HAVING TO GO EVERY WEEK to a shop I wouldn't normally visit so as I said we're giving them a miss this year. Somehow I have ended up with two Vouchers from week 4 and none from week 2. I am looking to trade my voucher from week 4, should be straight forward postal swap. We messed up and did 2 week 7 shops so we have a psare week 7 voucher in exchange for an 8, also my mum has a spare 6 and 5 so if anyone has an 8 hopefully we can dp a swap! !